Heavy Duty Blue Spot Cable Ties self locking Manufactured from heat resistant nylon 66 and ideal for use around the home and workplace. Features a resealable bag for quick and convenient storage and use. Each pack contains 120 assorted mixed colour cable ties. 3.6mm x 150mm - White cable ties - x 20. 3.6mm x 150mm - Black cable ties - x 20. 3.6mm x 150mm - Green cable ties - x 20. 3.6mm x 150mm - Red cable ties - x 20. 4.8mm x 200mm - Black cable ties - x 20. 4.8mm x 250mm - Silver cable ties - x 20. 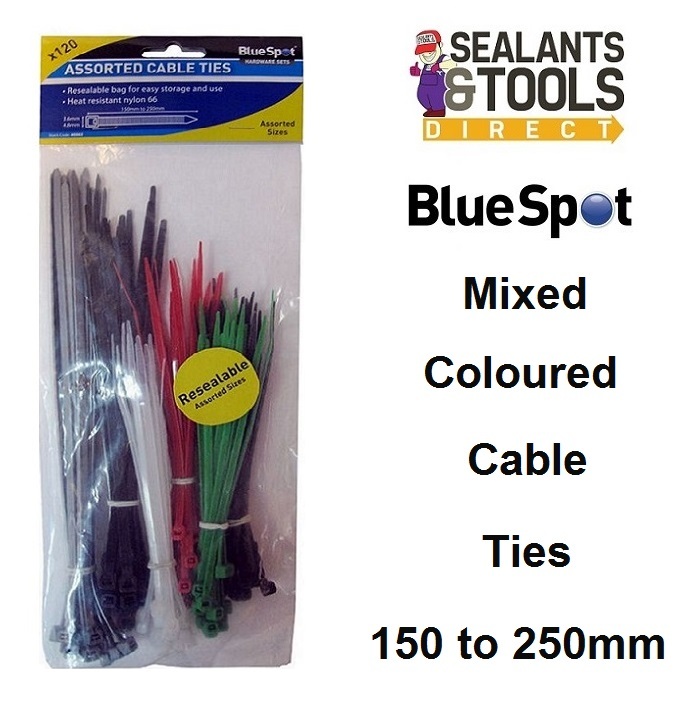 Take a look at the Full Range of Cable Ties.